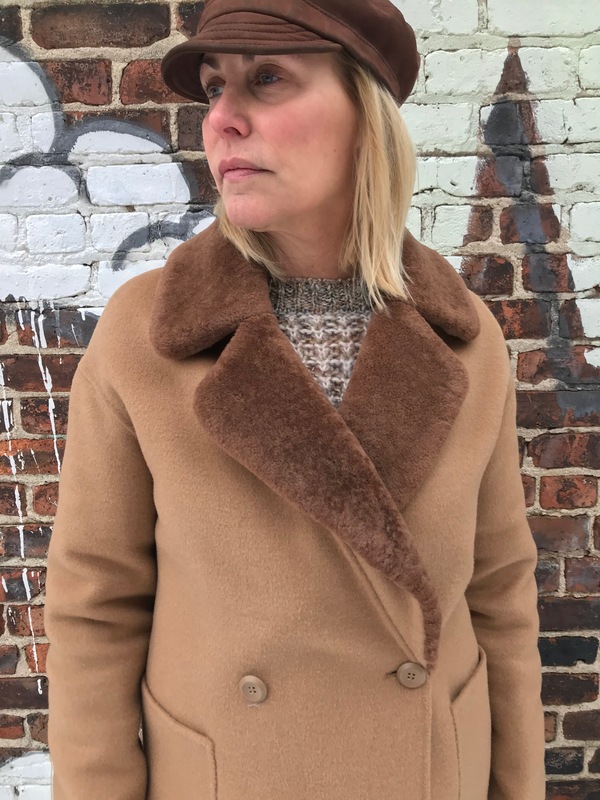 I love everything about this coat — the toasty color, easy fit (great for layering a chunky sweater underneath), the soft and cozy felted wool, stylish shearling collar, handy patch pockets and length (short enough to move, long enough to keep what you need covered, well, covered). For me, a fashion find is often all about the details. They’re what take an item from nice to gotta-have-it. This coat checks all the boxes. Best of all, while it’s a new(ish) purchase it was also on sale. Score! As you can see, I went with a head-to-toe neutral palette of beiges and browns. I tend to gravitate to these colors time and again. They’re easy to mix together and in my book flattering to every skin tone and hair color. 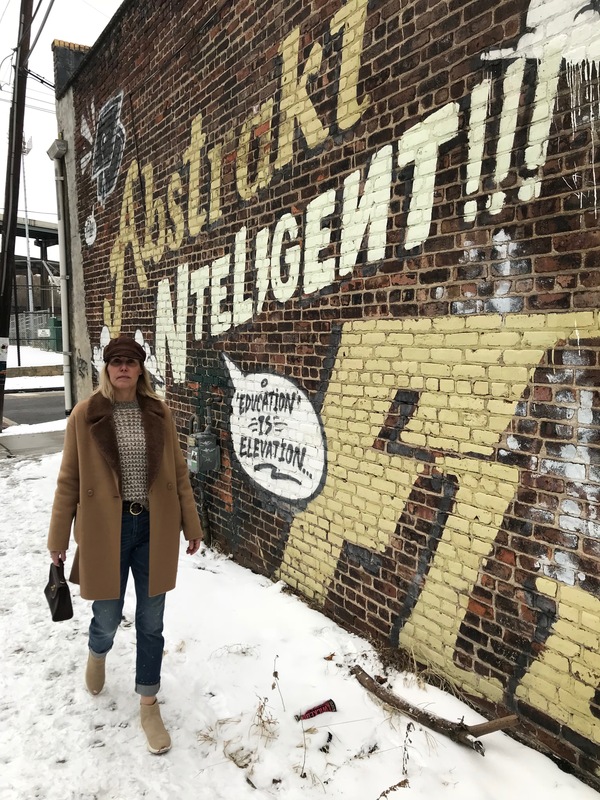 And while it’s fun to spice up your wardrobe with the color of the season, I prefer to invest in classic and versatile pieces that will stand the test of time. And that I’ll be happy to see when next fall rolls around. My motorcycle cap is an oldie but goodie. Honestly, I can’t even remember when I bought it but it was years ago. Its made of waterproof suede making it eminently practical. 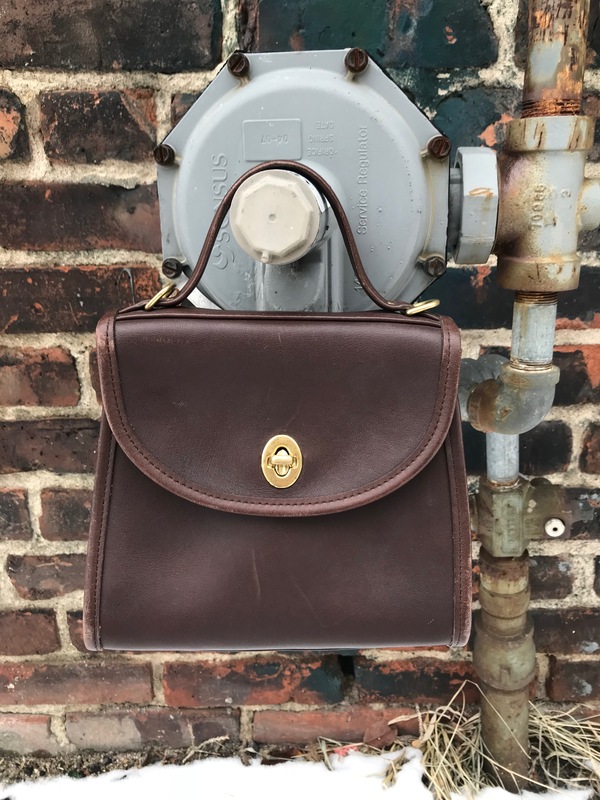 The mini Coach tote is vintage and was a $20 bargain I snatched up on a “junking” foray in Plattsburgh. It’s so cute but also holds all the essentials. These Reebok Chelsea Boots are sooooo comfortable. 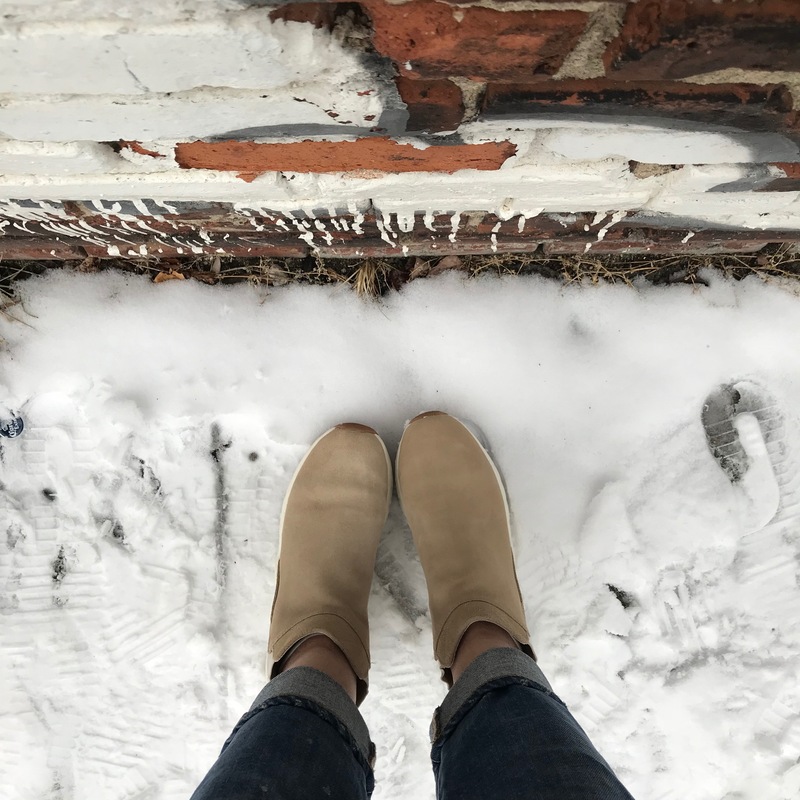 The soft suede upper keeps the look and feel luxurious, while the gum rubber sole gives you great traction. I waterproofed them so they’ve stayed looking (almost) brand new after many city and country strolls. Good thing too, as this color is no longer available (except on Ebay!). But it does come in black, which is probably more practical. And may just be added to my shoe collection, stat. My cuffed boyfriend jeans are another new love. They are just so darn easy to wear. I also like that I can wear them with a belt and tuck my choice of top in. 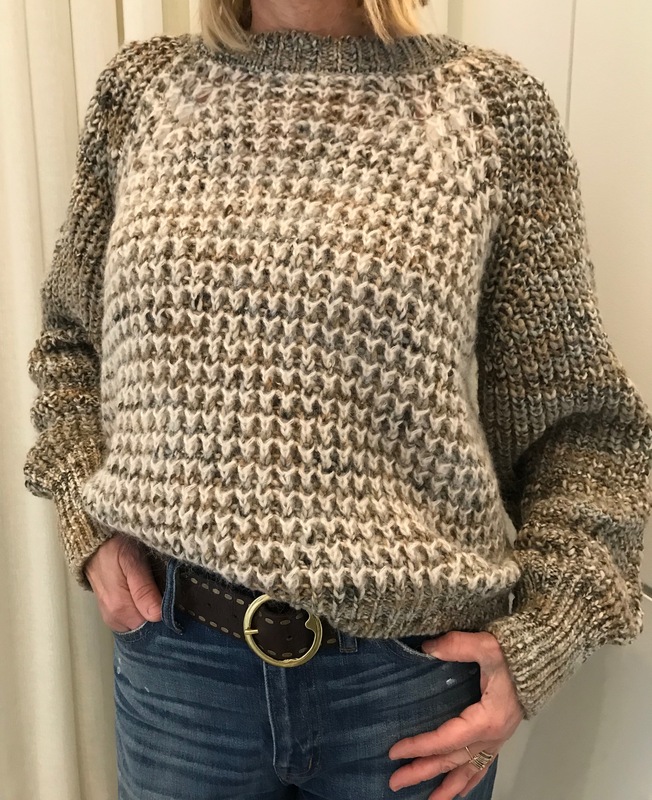 I cozied up to this chunky knit sweater the moment I spied it on the sale rack at Anthropologie. It’s knit in the softest, non-itchy wool blend. And the thick stitch, multi-colored motif elevates it from cute to chic. I’ve literally worn it again and again (and again) since I bought it. It was the only one in the store and a size Medium. I normally wear a Small but am glad I sized up, if even by chance. When the temps really drop I can layer a Uniqlo Heattech cami or tee underneath. We shot it on its own, because I wanted you to get a closer look. And…it’s still available and still on sale! Wishing you all peace, love and hope this holiday season! 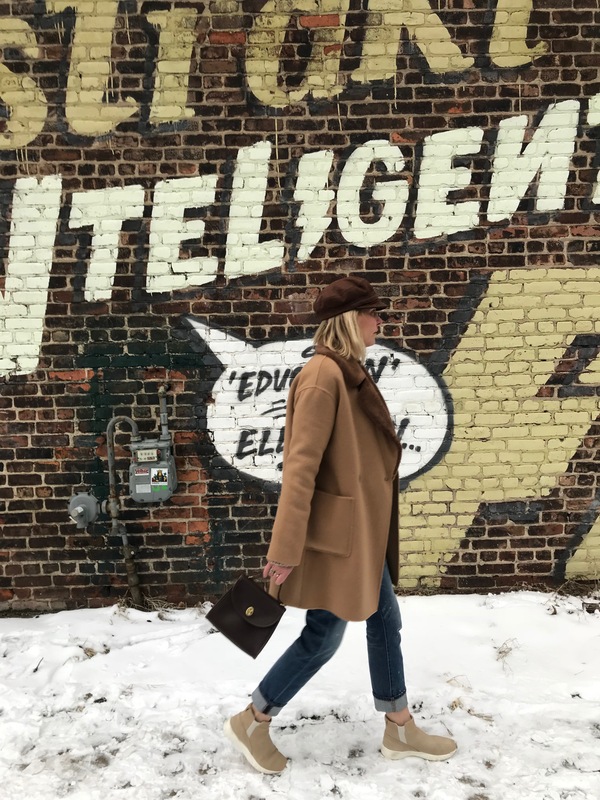 Coat: (Trina Turk, sold out) but chic and cozy alternatives here, here and here. Jeans: (Madewell, on sale but limited sizes). I’d also check out these and these (both in Tall, too). Shoes (Reebok, no longer available in this color) In Black here. Hat: (old) but super cute options here and here. A great look on you – and you’re right – flattering pieces on anyone! I just happened upon a suede ‘car-coat’ in a tan color at a consignment store (uh, I was looking for a table…) and I know I’ll get a ton of wear out of it. Btw, is ‘car-coat’ still a term?? I remember it from my mom! And I always thought it was so odd to have a coat you’d only wear in a….car!!! !